In 2010, years after Darkwing Duck went off the air, Disney revived the franchise with the announcement of a brand-new four-issue comic miniseries, later expanded to a ongoing monthly comic series, published by Boom Studios. This page covers arcs and tropes associated with the comic. 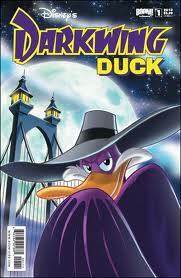 Darkwing: I am the terror that flaps in the night... I am Morgana Macawber's boyfriend. I am Launchpad McQuack's best friend. I am Gosalyn Mallard's father. I am Darkwing Duck. The one and only. Badass Family: If they weren't before "Crisis on Infinite Darkwings", the Mallard clan definitely qualifies now. In addition to Morgana's magic and Darkwing's Badassary, Gosalyn now has the GizmoDuck suit, and, as Quackwerk's CEO, Launchpad has an army of Herobots as his beck and call. Berserk Button: The mere mention of NegaDuck around Quackerjack causes him to beat up everything in sight. Liquidator even dropped his trademark salesman talk in order to warn people away from mentioning NegaDuck. Arc 1: Quackerjack, then Taurus Bulba takes over as the true one. Arc 2: Negaduck and Magica De Spell. Arc 3: F.O.W.L. High Command. Big Damn Heroes: Just when Darkwing, Scrooge, and the gang get all caught up in Negaduck's trap, Scrooge calls for help from an "Agent 44", alias Donald Duck. He goes through the corrupted Duckburg and cries out to the entire town to let out their 'inner Donald Duck' and makes everyone get so infuriated that Negaduck loses his focus. Big Damn Villains: When Taurus Bubla is revealed as the first arc's Big Bad, the Fearsome Four help Darkwing, Launchpad, and Gosalyn fight him...for about ten seconds before they are sent down a trap door. But now I lose my hold on the Darkwings! It is cliche, but...NOOOOO! Captain Ersatz: In the comic, the Chief of Police is a canine version of Batman's Jim Gordon. In issue #6, during the two-page spread, a few of the Darkwings are expies of Batman & Robin, Spider-Man, Silver Surfer, Fozzie Bear, Mr. Incredible and The Fourth Doctor to name a few. We also have such gems as Starducks, Hanna Alaska, Dungeons and Ducklords, and World of Whifflecraft. Then there's Femme Appeal, the spy introduced in issue #10. She's basically Emma Peel as a vixen. Civilian Villain: In the first issue of the new comic series, one of Drake Mallard's co-workers is his old classmate Elmo Sputterspark, aka Megavolt. Comic Book Time: The show ended in 1995, but the 2010 comic (which is supposed to take place about a year after the show's finale) shows Honker using a flatscreen computer to download songs by "Hannah Alaska." Crossover: Crisis On Infinite Darkwings involves Negaduck teaming up with one of Scrooge McDuck's villains, Magica DeSpell. Crossover Punchline: In issue 3 of the Boom! comic series, as Launchpad comments that there aren't a lot of openings out there for sidekick/pilots. Launchpad: (holding up the Ranger Plane) I can pilot this! Gadget: No. No, you cannot. Demonic Possession: Paddywhack pulled this one on Negaduck after he feeded enough of Negaduck's rage which gave him powers enough to take over his body. The combination of Paddywhack's powers and Negaduck's rage created a giant monster who almost destroyed St. Canard and the whole army of the Darkwings, only to be defeated by The Power of Love. Digital Piracy Is Evil: The Crimebots target Honker for file sharing. Drake agrees with the "don't steal music" part, but thinks carting him off to detention camp is going too far. Disney Death: Gosalyn in issue #4. "I am the HR-Bot. Get ready for the employee evaluation...OF DOOM!" Eldritch Abomination: Comic #9 begins the newest story arc: Darkwing must join forces with Steelbeak to stop F.O.W.L. from summoning the dread Duckthulhu, an elder being from beyond the stars that "has an incomprehensible mystical presence that obliterates all free will and sanity" all because of Quackwerks taking over the city before and making S.H.U.S.H. and F.O.W.L. almost disappear. Enemy Mine: Darkwing and Steelbeak in Arc #3. Even Evil Has Loved Ones: In the Darkwing Annual, we find out that during Quackerjack's time in Quackwerk's toy division, he managed to make friends and even got a girlfriend. Evil Counterpart: The series sets up Magica DeSpell as Morgana's evil counterpart. NegaDuck: "Are you kidding me? Going after Darkwing Duck's secret identity, going after his entire life, is a job fit for only the best villain this two bit town has to offer. Face it clown...You're just not mean enough for this. Getting Crap Past the Radar: Issue #2 of the comic. Darkwing: Now all those orders I filed for chains and cowboy hats make sense! All this time I thought someone had a unique way of enjoying the weekend. Happens literally in Issue #3 of the comic when Megavolt says "I bet he had a crappy office job all this time!" in reference to Darkwing. I Let Gwen Stacy Die: One of the alternate Darkwings from "Crisis on Infinite Darkwings" took on Gosalyn's Quiverwing Quack persona when his Gosalyn pulled a Heroic Sacrifice, and there was nothing he could do to save her. Interestingly, he's shown Curb Stomping Darkwarrior Duck, who also lost his Gosalyn, but had a very different reaction to the loss. Literal Split Personality: Happens to Negaduck at the end of "Crisis On Infinite Darkwings". To the n-th degree, it turns out. My Name Is Not Durwood: A commuter on Drake's bus makes small talk about "good ol' Duck-man". Drake visibly uses every iota of willpower not shouting out a correction. It might be a Shout-Out/Take That to a different "Duckman". Mythology Gag: In #4, when Scrooge McDuck is given control of Quackerwerks and places Launchpad in charge, alluding to him having worked for him previously. In #6, we see a dozen versions of Darkwing that appeared in the original cartoon, including Dark Warrior Duck, Arachnoduck, "Thug" Darkwing, Darkwing Dog, Spaceman Darkwing, and Privateer Darkwing. The Blot uses the alias of "Bob" when working as a campaign manager, which he also did in early follow-ups to the original Floyd Gottfredson story. Not Brainwashed: Darkwarrior Duck told Quiverwing Darkwing it was so in his case. While the rest of the Darkwings had been hexed by Magica De Spell in part of her and Negaduck's plan to attack St. Canard, he had voluntarily allied with them so he would get a chance to "clean up St. Canard". OOC Is Serious Business: Liquidator momentarily drops his Verbal Tic of ad slogans to warn Megavolt about Quackerjack's Berserk Button. Quackerjack: Never! EVER! SAY! THAT! NAME! Putting the Band Back Together: As of the first issue, Quackerjack seems to be doing this with the Fearsome Four, even using the exact phrase. Reverse Mole: Femme Appeal turns out to be one. Shut UP, Hannibal: Issue #4 of the Boom! comic has Megavolt, at the end of his inner monologue, zap Taurus Bulba during the middle of his speech, freeing Darkwing and the other prisoners. Soft Glass: Averted in Darkwing Annual. After jumping through a window, Darkwing is (briefly) covered in shards of glass. Darkwing: I never did that before; now I know why. Spy Catsuit: Femme Appeal wears one. Time Skip: The comic takes place over a year after the end of the series. Took a Level in Badass: In issue #2, Quackerjack goes down this road (carrying Joker-level insanity with him) at the very mention of NegaDuck's name. "Mr. Banana Brain": Hello, folks! I'm full of hate and wires! Launchpad has scored himself some badass points after becoming the head of Quackwerks. When the alternate reality Darkwings start showing up, he immediately activates all the robots to combat mode and flies into the fray, taking out superheroes left and right. The War Has Just Begun: Darkwarrior Duck almost said the exact words in issue #6 just as the army of the Darkwings attacked St. Canard. Wide Eyes and Shrunken Irises: Quackerjack in the comics, after NegaDuck is mentioned. This page was last edited on 30 March 2018, at 01:19.